An integrated steel plant operates several processes which cause pollution of the environment. Steel plant management recognizes the importance of environmental matters and knows that the environmental performance of the steel plant is under scrutiny not only by the regulating authorities but also by a wide range of interested parties. Environmental audit, in general, is a methodical examination involving analyses, tests, and confirmations to verify whether the steel plant’s emissions, discharges and waste management comply with statutory requirements, internal norms and accepted practices. During the environmental audit, procedures and practices of the steel plant are also examined. Environmental audits are usually voluntary in nature and they are not the requirement which is imposed by the regulating agencies. Environmental auditing began in the USA in the early 1970s, when a handful of industrial organizations, working independently and on their own initiatives, developed environmental auditing programmes as internal management tools to help review and evaluate the status of the organizations’ operating units. It enabled managers to check compliance with (i) local environmental laws and regulations. (ii) National environmental laws and regulations, and (iii) corporate policies. It was also regarded as an activity useful for avoiding prosecution or civil law suits under the increasing pressures from environmental legislation. In the rest of the world, the evolution of environmental auditing was largely due to the influence of USA subsidiary companies operating abroad. Environmental auditing only became widely accepted by industry in the late 1980s as a common management tool in developed countries, and is increasingly being applied in developing countries by both multi-national and local industry. As organizations began to realize the value of paying attention to environmental issues, the concept of environmental auditing itself has evolved to address wider issues than simply legal and regulatory compliance. The widening use of environmental audits reflects the broadening attitudes of organizations towards environmental issues in general, and the increasing pressures from investors, insurers, consumers, and other interested parties. Environmental auditing is therefore playing an increasingly common role in the management of organizations worldwide. The reasons why the steel plants undertake an environmental audit are as follows. Environmental audits enable the management of the steel plant to see exactly what is happening within the steel plant and to check the operation (or otherwise) of systems and procedures. It assures an adequate, up to date environmental data for internal management awareness and decision making. Some environmental auditing programmes have been motivated by the occurrence of an environmental problem or incident, that is, a ‘reactive’ response while others have been established in response to a desire to anticipate and head off potential problems that is to take a ‘proactive’ stance. Environment audit is used to help improve existing plant activities, with the aim of reducing the adverse effects of these activities on the environment. It studies the environmental effects of the steel plant in a systematic and documented manner and produces an environmental audit report. There are many reasons for undertaking an environmental audit, which include issues such as environmental legislation and pressure from the stake holders. Environment audit is a management tool comprising of a systematic, documented, periodic and objective evaluation of how well are the organization, management and equipment and how effective are the environment protection measures with regards to the compliance of the norms fixed by the regulating authorities, standards applicable and internal norms. The audit is performed with an aim of helping or safeguarding the environment by facilitating the management control of practices. It also informs the management how the steel plant is addressing the environmental concerns it is facing. Audit brings up areas of deficiencies where focused management action is needed for improvement. The key concepts in the environmental audit (Fig 1) include the following. Environmental audit can cover the entire plant or a particular shop. It can cover all the aspects of environmental protection namely (i) air emissions, (ii) liquid effluent discharges, (iii) solid waste management, (iv) noise control, and (v) other pollutants e.g. hazardous waste etc., or it can focus on one of the aspect at a time. Environmental audits also reviews the management practices being followed currently. Environmental audit can also be done for the steel plant’s finished steel products for the purpose of carrying out the life cycle studies. Environmental audits are also part of the environment management system (EMS). This audit connected with the EMS provides the means by which the effective operation of the system can be checked, and remedial action taken if necessary. Whatever the objectives, carrying out an environmental audit essentially involves the following three main questions. What are the current effects of the steel plant operation on the environment? Can the steel plant reduce the negative effects on the environment? How can the steel plant make further improvements? These questions apply equally to an audit whether it is for the entire steel plant, a particular shop of the plant, or even an audit of a particular environmental aspect. Environmental audit helps to reveal the likely weaknesses of the steel plant’s strategy towards environmental protection. Hence it reduces the risk of unexpected events. A properly prepared and conducted environmental audit brings real benefits to the steel plant provided the plant management is committed to act on the results of the audit. The benefits of the environmental audit include the following. A range of less tangible benefits environmental audit includes (i) increased awareness of environmental responsibilities among the employees, (ii) increased management confidence due to a feeling of security that the compliance (and safety) status of the plant is confirmed and documented, (iii) favourable publicity, and (iv) improved relationship with regulatory authorities. 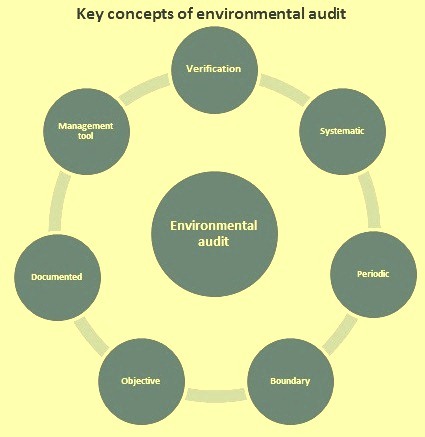 Environmental audit can be an internal audit which is conducted by an internal audit team led by the environment management department and include persons who are not connected with the department being audited. However a person connected with the environmental aspects of the department assists the audit team in the audit. Environmental audit can also be conducted by an external agency. External audit is normally adopted to get a third party view regarding the efficacy of the environment control equipments as well as the environmental management organization in the steel plant. Environmental audit is not to be mixed up with environmental impact assessment (EIA). Both environmental auditing and EIA are environmental management tools, and both share some common terminology, for example, ‘impact’, ‘effect’, and ‘significant’, but there are some important differences between the two. Environmental impact assessment is an anticipatory tool, that is, it takes place before an action is carried out. EIA therefore attempts to predict the impact on the environment of a future action and to provide this information to those who take the decision on whether the steel plant project is to be sanctioned or not. EIA is also a legally mandated tool. Environmental auditing is carried out when a development is already in place, and is used to check on existing practices, assessing the environmental effects of current activities. Environmental auditing therefore provides a ‘snap-shot’ of looking at what is happening at that point in time in the steel plant. it is a not a legally mandated tool but a voluntary activity.